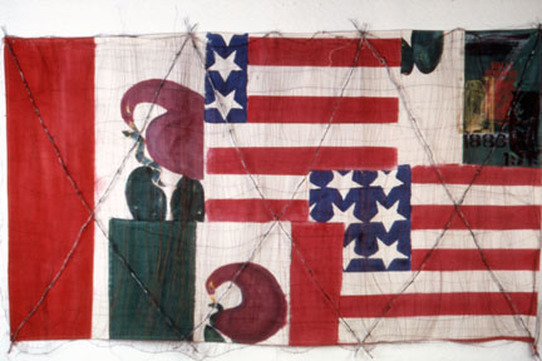 Fiber, fabric, wire, threads, 4' x 6' x 3"
This was my first flag merger. I thought of myself as the x’s stuck between the wire woven fence and the two flags as one. Emiliano Zapata heroically blazed the way through this mire and Guadalupe kept shining on. The eagle seems feminine, maternal, the way the land spirit feels. ​Once borders are crossed, notions of nation are re-evaluated and reset.